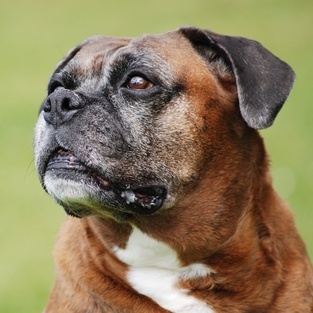 ​Cyrus was a very much loved white Boxer boy and is still very sorely missed by his Mum. Last year I had the pleasure of meeting their Boxer girl RUBY, capturing some photos of her and creating the first pencil portrait. They loved it so much, they asked me if it would be possible to do one of Cyrus too. They had few photos that could be used, but having done a few Boxers in the past, I decided to adapt this chosen reference. The reference photo posed a challenge in many ways - it was a little dark and very blurry, he was looking down and the top of his head was clipped from the photograph, however I had chosen this image from a collection of others because the composition would be perfect, knowing that I could iron out all the problems by using the details from other white Boxer dog photos I had in my personal reference library and I wanted Cyrus to be portrayed in a comfortable place, on his blanket. He has arrived home Karen, just got to hold him for a while and then put him away until he is framed. 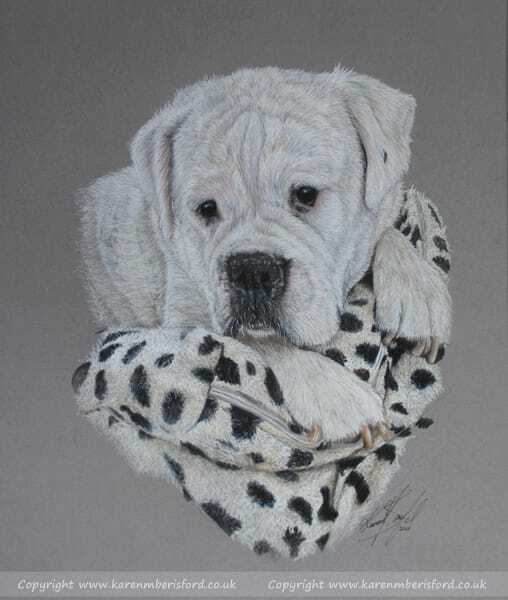 ​This is the first portrait completed for the Commissionee of their Fawn Boxer dog who very sadly passed over the Rainbow bridge in January 2016. I was lucky enough to meet her and get some photographs for her portrait, this being my favourite. The portrait was also completed in Coloured pencils. Please click on the image if you wish to find out more and see the progress of this portrait come together too.